Wool is the most commonly used natural fibre in carpet manufacturing. It has good protective qualities like stain protection, resiliency, and soil resistance. However, wool carpets are considerably more delicate than synthetic carpets and need more attentive care. That’s why we provide you with the best trick and tips to maintain your wool carpet in perfect condition depending on the problem. Let’s have a more detailed look at each one of the steps. more dirt is deposited on the carpet, the more thoroughgoing the maintenance programme has to be. In this sense, regular vacuuming is essential. Use a quality vacuum cleaner with soft bristles to gently agitate any trapped dirt and dust. frequently (every day if possible) in the first week to remove surface lint, dust, and fluff. Thereafter continue to vacuum thoroughly at least weekly and more frequently in high traffic areas. Since wool carpets are more sensitive than synthetic carpets, any kind of procedure is demanded to be done attentively. Shampooing, do-it-yourself or steam cleaning is not recommended by carpet manufacturers. 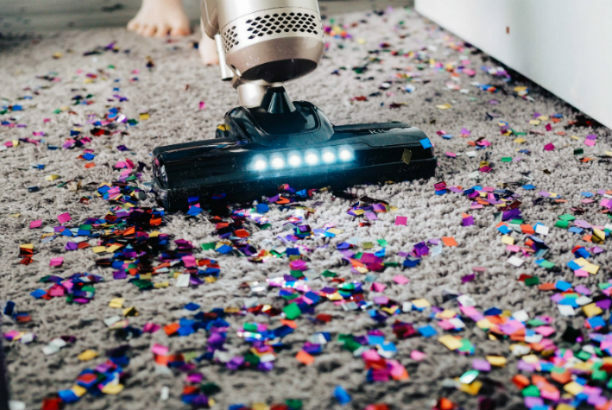 Instead, they prescribe cleaning done by certified carpet technicians using hot water extraction or dry carpet cleaning methods, every 12 to 18 months. This breathes new life into your carpet and removes one of the mine reasons for significant dulling of colors – oily, sticky soil and well-settled soil. Here is how the two methods are being done. This is the most effective professional carpet cleaning procedure available. An industrial-grade machine is used to shoot hot water (mixed with detergent) deep between the fibres of the items. This effectively dislodges the accumulated filth and dust. At the same time, a powerful suction attachment on the nozzle is vacuuming about 95% of the moisture, soil and the dislodged filth almost simultaneously. The treated object is left slightly damp so it could dry quickly thanks to the air mover. Dry cleaning is specially formulated to deal with delicate items such as natural fibre like wool. However, please note that it does not the best method to remove stains. The process is simple and great for refreshing. It works by applying low-moisture non-toxic cleaning powder to the pile of the carpet and rubbing in with a rotating brush. This way the powder sticks to the residing dirt and dust particles. In the end, the item is vacuum cleaned so the powder is removed along with all the unwanted particles. There is an important difference between spots and stains that is mandatory to be mentioned. Spots are created when something is being dropped or spilled on the carpet, and substance does not have the ability to permanently bond to the fiber or cause damage. Fast reaction and proper cleaning steps can completely remove the spot from the carpet. Stains contrariwise are created by something being dropped on a carpet, but the substance has the ability to permanently damage the carpet fibre (bleach for example). And if not acted upon fast the substance might permanently change colour to the carpet. It always helps to be prepared with the right information for dealing with different types of accidents like wine, felt tip, tea, coffee, pet vomit, blood, pee, etc. We prepared our most detailed list to help you fight this spots. Soak up as much of the spill as possible, using a clean, absorbent cloth, until there are no more leftovers on the cloth. Don’t scrub, as scrubbing will push the dirt further into the carpet and damage the fibres. Use water or wool approved cleaning spray (which is colour, fibre and re-soiling safe) to complete the weeding out. Spray this onto the cloth first, and then press the spill. An important point to remember is to spray the cloth rather than the carpet. 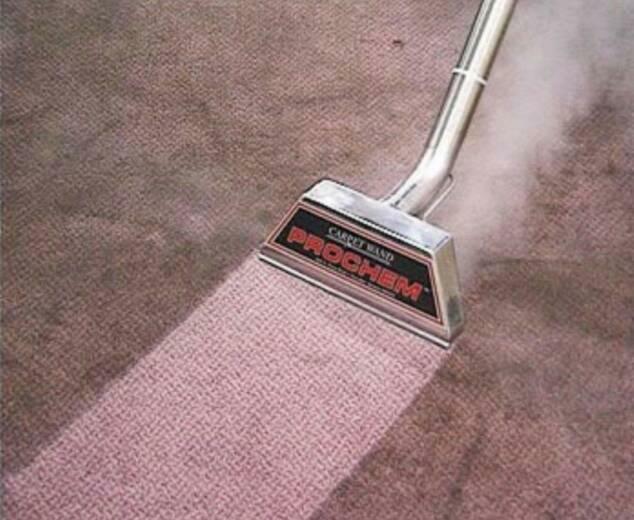 Spraying directly on the carpet will drive the grime deeper and wider. Do this process as quickly as possible, since its going to massively reduce the chance of forming a stain in your wool carpet. Start with baking soda and vinegar. 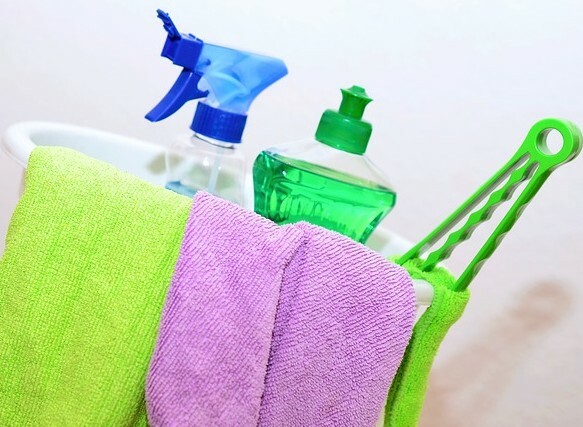 Baking soda will absorb the odor and white vinegar will help disinfect the area. Scatter baking soda on the stain and let it rest for 30 minutes then vacuum. Make a cleaning solution out of half a cup vinegar, 2 cups water, and half teaspoon liquid dishwasher detergent.Use a clean cloth or sponge. Dipp it into the cleaning solution. Squeeze and twist it out. Lightly rub the spot using circular movements. Rub again with a water-dampened sponge or cloth over the area. Dry up with a paper towel. For the most common problems like a dog or cat urine, vomit, poop, mud, diarrhea etc. its also good to keep commercial stain remover for wool as it will help with some stubborn spots. Don’t forget to use minimum amounts of water. Wool carries a risk of shrinking under improper maintenance, so it is essential that it is treated correctly by professionals who have experience in working with wool carpets and who can clean it effectively without damaging the carpet. The speed with which a spill is cleaned up is the most important ingredient in preventing carpet stains. Unfortunately, there are some occasions when a stain will occur and you won’t discover it until much later. A party in your home or office could lead to spilled drinks, or your kids might spill some soda that is not immediately reported. Here is a complete list of different stains and the according methods you can use to remove the stains. Blot with white kitchen roll or paper tissues. Commercial stain remover for wool. Absorbent paper or paper tissue and hot iron. Chewing gum remover (solvent or freeze type). Nail varnish remover or acetone. White spirit or turpentine substitute. Surgical spirit (ethyl alcohol or ethanol). Rub gently with coarse sandpaper. One teaspoon of wool detergent with one teaspoon of white vinegar in one liter of warm water. Depending on the nature of the stain, it may require several treatments before all trace of it has vanished. No technic here can guarantee 100% stain removal! With all these methods use a minimum amount of water, otherwise, you’re ricking to shrink the carpet. Most of the dirt is coming from outside. As preventive maintenance, entrance mats also referred to as scraper, walk-off or barrier mats, should be placed outside all exterior doorways, and at entrances to carpeted areas. Adequate lengths of matting inside these entrances ensure to catch dirt and moisture from outdoor sources. Clean the mats regularly. Use furniture cups and occasionally rearrange furniture. The compression of carpet tufts due to foot traffic or furniture is known as crushing. Regular vacuuming or using your fingers to lift and groom the pile in severely affected areas should help reduce crushing. Carpets like all other dyed textiles will slowly lose color over time when exposed to direct sunlight. Use curtains, blinds, shades or awnings to keep your carpet from prolonged direct sunlight. Although wool fibers have a natural wax coating, that stops dirt embedding, remember that its mandatory to regularly vacuum your wool carpet or rug. As this will drastically improve the durability of the carpet and will make it easier for cleaning in the future. If you find this article helpful please do share. Now you know how to treat your wool carpet, every type of stain requires a different approach and it might be too much of a hassle to clean it yourself. If that’s the case, you can always entrust the job to a professional and this way, avoid any mishaps. Filling in your details in our contact form. Find out more about how can we help on our carpet cleaning service page. Copyright 2013 - 2019 © Go Cleaners London.